CARPINTERIA, Calif., Aug. 6, 2009 -- A deployable satellite reflector and boom assembly from Northrop Grumman Corporation (NYSE:NOC) will help NASA's Jet Propulsion Laboratory (JPL) map soil moisture and the freezing and thawing cycles globally with unprecedented accuracy, resolution and coverage. 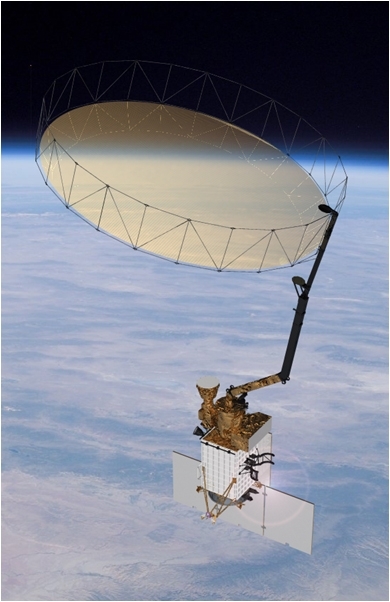 The company's AstroMesh-Lite configuration deployable reflector will be used on JPL's Soil Moisture Active/Passive (SMAP) mission targeted for launch in 2014. This mission will use a combined radiometer and high-resolution radar to make direct measurements of soil moisture and freeze/thaw state to aid understanding of regional and global water cycles, ecosystem productivity, and the processes that link water, energy and carbon cycles. "The SMAP mission is critical to understanding the health of the Earth's ecology. We are proud of our successful history of teaming with JPL on multiple planetary missions going back as far as Voyager to the outer planets and more recently to Mars," said Richard Nelson, general manager of Astro Aerospace, a Carpinteria-based strategic business unit of Northrop Grumman's Aerospace Systems sector. The unit specializes in advanced deployable structures for space applications. AstroMesh-Lite is a member of Northrop Grumman's flight proven AstroMesh "Perimeter Truss" reflector line, optimized for the three- to eight-meter aperture size. For the SMAP mission, its approximately six-meter aperture will provide high-resolution data to enable improvements to weather and climate forecasts, flood prediction and drought monitoring, and measurement of net carbon dioxide uptake in forested regions. "Astro Aerospace has a stellar history of 100 percent mission deployment success," noted Chris Yamada, general manager for Northrop Grumman Aerospace Systems' strategic business units. "The AstroMesh family is the only deployable mesh reflector with a perfect on-orbit deployment record -- no failures, and no anomalies. Astro's selection to the SMAP team is a tribute to its continuing commitment to assure mission success." For more than 50 years, Astro Aerospace has been a pioneer in the development of space deployable structures and technologies. Products range from AstroMesh furlable reflectors, antennas, truss masts, telescopic booms, storable tubular extendible members, solar array and planar radar-array deployments.